Hutchinson Trinity and Ell-Saline have started 4-0 in Heart of America play against the same four opponents: Sedgwick, Whitewater-Remington, Moundridge and Inman. The teams have nearly identical point differentials. Trinity stands at 138-52, while Ell-Saline is at 129-42. Since Saturday morning, Trinity coach Jordan Bell and his staff has told the squad that the Celtics and Ell-Saline are similar in record and personnel. 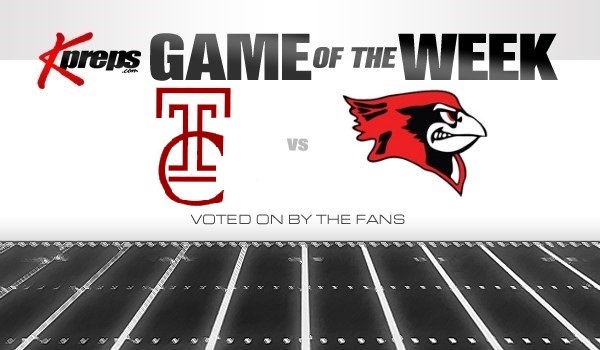 Both feature a junior dual threat quarterback in his second season as a starter: Trinity’s Kaleb Hammeke and the Cardinals’ Nick Davenport. “They are as close as you can find to a mirror team as yourself,” Bell said. “I think that we have very similar philosophies on offense and defense, and just our skill positions, our strengths on both sides of the football, I think match up well. On Friday, Ell-Saline, ranked fifth in Class 2-1A and one of just five unbeatens left in the classification, plays host to Trinity. The 3A Celtics have captured six straight wins in the series. Ell-Saline, 3-6 the last two seasons, opened with a high-profile win against Sedgwick and then reeled off three victories with just 21 points permitted. The Cardinals have 14 straight wins versus Remington, Moundridge and Inman, teams that are a combined 0-12 this year. Last season Ell-Saline opened 3-1 and then dropped its final five, including 8-0 to Trinity. The back half is a challenging schedule that includes Friday and Smith Center, ranked No. 1 in 2-1A, in districts. Trinity went 5-4 in 2016 and returned seven junior starters and just one senior, 6-foot-2, 230-pound Connor Wolfe. One of three seniors this fall, Wolfe has improved his strength and moved inside to nose guard in the 3-4 scheme. Wolfe has controlled the gaps, and Bell said the lineman “has really bought” into the position. A three-year starter, Wolfe had a nice interception Week 3 against Remington on a ball that was tipped six times. Matthew Creed has a team-high three TD receptions. “His maturity level and his leadership has done really well for us,” Bell said of Wolfe. Similar to 3A Garden Plain’s Nate Pauly last year, Hammeke has become an electrifying presence in all three phases. He has completed 27 of 50 passes for 344 yards with a 4/1 TD/INT ratio. Hammeke has 61 rushes for 455 yards and eight scores. He has picked off four passes with 183 punt-return yards, including a touchdown. Bell said Hammeke has “meant a lot” to the team, not only with production, but also his leadership, understanding, intelligence and maturity. Like the rest of the junior class, Bell has seen Hammeke progress from the start of August 2016 in the weight room. Junior linebacker Aaron Guerrero leads with 33 tackles, and junior defensive lineman Jack Neal has five sacks, both team-highs. Neal and junior lineman Alex Hammersmith have started since they were freshmen. “We knew we were going to take some lumps last year, but we can see the progression this year from the experience from last year,” Bell said. Freshman Andrew Bergmeier has a Celtic-best 464 rushing yards with 58 carries and five rushing scores. Freshman outside linebacker Evan Remar has 21 tackles. Bell saw Bergmeier in junior high and believed, based on his body type and maturity, that he could produce this season. Bell called Remar a surprise. Remar played well at the Southwestern College summer team camp. The pair has better physical strength than most freshmen. Ell-Saline has plenty of size on the offensive front with seniors Mason Farrell, Brandon Headlough and Avery Bradley. Defensively, Farrell has moved to linebacker to fill a need and has played well. Ell-Saline freshman free safety Treyton Peterson has intercepted five passes, including a pick-six. Sophomore slot Sawyer Kramer and senior wide receiver Zaide Korb have stepped up for the Cardinals. Kramer has five touchdowns, three of at least 29 yards. Korb, often hurt through his career, decided to not play anymore after he suffered a preseason injury. A longtime student aide for King in the classroom, Korb still attended the practices and games. After the Week 2 win at Remington, Korb asked King if he could return. He tallied 84 receiving yards in Week 3 and a score last week. “Hopefully he can continue to play for the rest of the year, because he is a boy that deserves it,” King said. Davenport has recorded 855 yards in total offense with 13 scores accounted for. Senior running back Bryce Lange (121 rushing yards against Sedgwick) was suffered a sprain early in Week 2. He has only played defense since because of a foot issue. “We were trying to keep him healthy so he could make this game against Trinity,” King said.